Brussels gets overlooked sometimes, but I think it’s a wonderful city. It has grand architecture like Paris but with a more laid back atmosphere. That vibe is a big part of why I think Brussels makes a great choice for a city break. Take some time to see the sights that make Brussels unique, and relax! 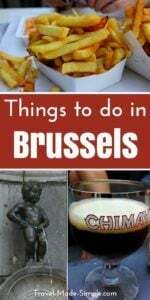 Here’s what to do in Brussels, plus tips in case you only have one day in Brussels. 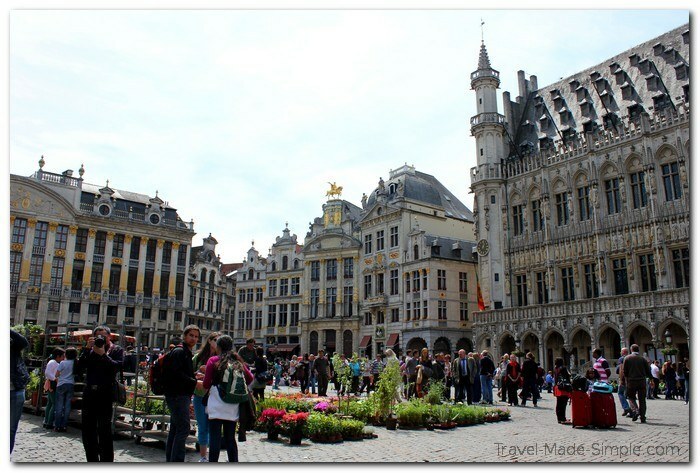 Start your trip in the main square, which is within walking distance to lots of Brussels attractions. This is where the Grand Palace is. Most days there is a market set up in the square where you can buy flowers, souvenirs, fruit, or whatever happens to be on hand that day. It’s a nice place to sit and watch the world go by while admiring the details of the Palace, city hall, and the other buildings on the perimeter of the square. 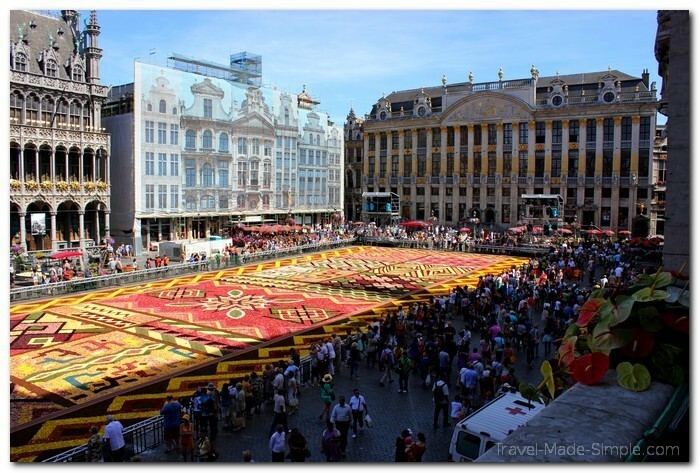 In August of even numbered years, Brussels holds a flower carpet festival in this square. Intricate designs are made using thousands of flowers based on a different theme each time. It only lasts a few days, but it’s an amazing sight to see. 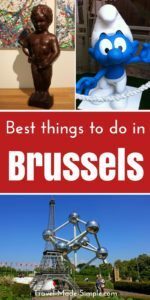 Check here for dates to plan your trip to Brussels to see it. Consider taking a half day Brussels walking tour like this one to the highlights of the city. 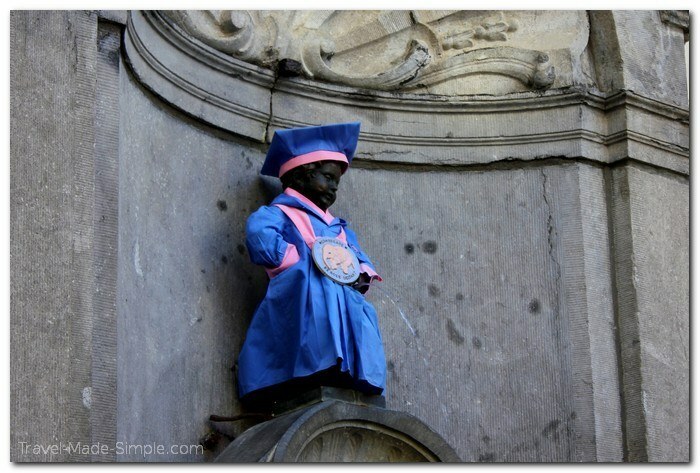 A short walk from the square, you’ll find the famous Manneken Pis. This peeing boy statue is often dressed in silly outfits, and you never know what he’ll be wearing from one day to the next. He has 800 outfits! The Royal Palace opens its doors to the public every summer and it’s free of charge. A number of rooms are open for you to see, sort of like a museum, with some impressive displays of antiques and art. Check here for more info and exact dates. Like comics? Belgium is known for them. The Smurfs originated here, along with many others. Visit the Belgium Comic Strip Center for a closer look at the humor. Another one of the fun things to do in Brussels is Mini Europe. It’s near the famous Atomium, so you could see them both on the same day. Mini Europe has displays from every country in the EU that represent the country in miniature form, complete with moving planes, trains, boats and more. Fun for kids, but even as an adult, I think you’ll enjoy it. I certainly did! Belgium is known for several different types of food. It’s reasonable that this might play a big part in your trip. Taste frites (fries, but don’t call them French fries!) with a wide variety of dipping sauces. Try decadent Belgian chocolate. Sample amazing and creative Belgian beers throughout Brussels. Grab some fluffy waffles from a street vendor or a fancier version for dessert one night. Seek out some mussels from Brussels. Missing your veggies while on vacation? Maybe order some Brussels sprouts. Food in Brussels is incredibly tasty, and spending a week there would only scratch the surface. Aside from all those foods they’re known for, Belgian food often has an interesting French influence, though the country’s small size means there are other influences as well. This is one of the areas that can really benefit from a longer stay. By basing yourself in one city for more than a few days, you’ll have more time to try different local foods. Ask around for recommendations while you’re there. The best restaurant recommendations usually come from the people who live there. In between seeing the famous sights, take time to wander off to find other details hidden around the city. 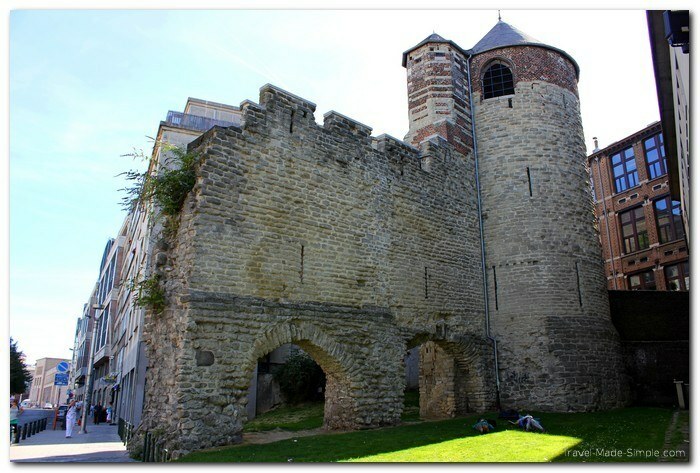 Did you know there are still a few pieces of medieval walls in Brussels? How about a park with giant statues of the city’s iconic food? There’s interesting street art all over the city, two lesser-known peeing statues, and so much more. You just have to dig a little deeper. It’s a bit difficult to give solid direction on how to find those little things that give a city its charm. The things that strike you as intriguing might be boring to someone else, or vice versa. But when you stay in one place for a week (or even longer!) you’ll feel more relaxed and less rushed, and this goes a long way in helping you wander around and just see what pops out. If you have time, there are several great cities in Belgium that are also worth seeing. Bruges, Ghent, Antwerp, just to name a few, can be done as day trips from Brussels. There’s something for everyone, whether you’re looking for small and charming, modern, or war history. Read more about Brussels day trips here. While I think you should spend more time here, what if you only have one day in Brussels? Luckily you can still see some of the most popular tourist attractions in Brussels in one day. Start your morning with a waffle and wander over to the main square to admire the Grand Palace. The architecture here is fabulous. Then walk a few blocks to see the famous Mannekin Pis and his latest outfit. 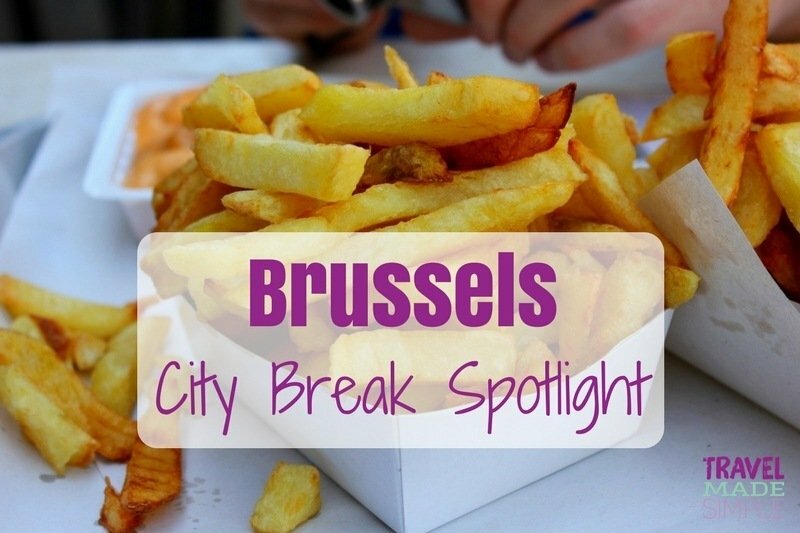 Have lunch – preferably somewhere serving Belgium frites (fries). 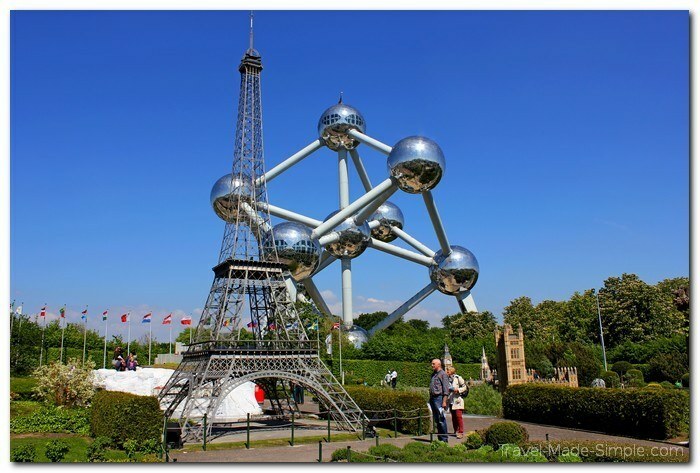 After your meal, go see the Atomium and Mini Europe. Afterwards, treat yourself with some delicious Belgian chocolate. Save time to explore the Royal Palace if you’re in Brussels while it’s open. Otherwise, choose another museum based on your interests, such as the Royal Museums of Fine Arts, the Magritte Museum, the Musical Instruments Museum, the Museum of Natural Sciences, or the Belgian Comic Strip Center. Sample a couple Belgian beers with dinner. Belgium is known for having some of the best beer in the world, so you don’t want to miss out. I love your take on Brussels. I’ve read about the city before on other blogs but I love in particular your emphasis on the quirky side of the city. I think for me when I consider a destination, one of the things at the front of my mind is the question ‘what makes this city really stand out?’ For Brussels, it’s really three things – the Manneken Pis, Belgians fries, although they don’t call them that and the big one that stands out for me: Belgian Beer. I suppose there is the fourth one in that the Belgians can really play Soccer as they showed at the recent world cup. Thanks Matthew! Brussels is such a great city, I really think it’s a shame it gets skipped. And yes, the beer is probably the biggest thing that stands out to me. The fries are delicious, and the Manneken Pis is entertaining for a couple of minutes, but the variety and depth of the beer culture is wonderful. I don’t know much about comics myself, but even still, there are hints of Brussels’ history of comics throughout the city and it gives the city a lot of character.